Sodas, sports beverages, fruit juices, lattes--sugary drinks are everywhere, and they’re responsible for nearly half of our daily intake of added sugars. Not only do these added sugars contain no nutritional value, they can also slow weight loss and increase risk for numerous health issues. Swap them out for these easy alternatives to sugary drinks, and you could cut your added sugar consumption down to a healthy level. Why cut down on added sugars? Why are added sugars so bad for you? You may have heard that not all calories are created equally, and added sugars are a prime example of that. For all the calories they add to foods and drinks, they contain no essential nutrients. Drinking sugary beverages can also have a number of negative health effects. According to the Boston Public Health Commission, daily consumption can increase your risk of heart disease, type two diabetes, obesity, tooth decay, metabolic syndrome, and gout. Most Americans consume 270 calories worth of added sugars daily, according to the Office of Disease Prevention and Health Promotion. The organization recommends that the average adult limit their added sugars to 10% of their daily caloric intake--that’s 200 calories based on a 2,000 calorie diet. One of the easiest ways lower our consumption of added sugars is through the beverages we drink. Soda is a big offender, but it’s not the only drink that can unwittingly drive up your sugar consumption. Fruit juices, sports beverages, and iced teas often contain high amounts of added sugar as well. Here are some easy, healthy swaps for popular drinks. If you crave soda for the carbonation, swap it out for seltzer or sparkling water with natural fruit flavors and limited additives. This is healthier than just opting for diet sodas, which contain sugar substitutes that can actually lead to increased sugar cravings. 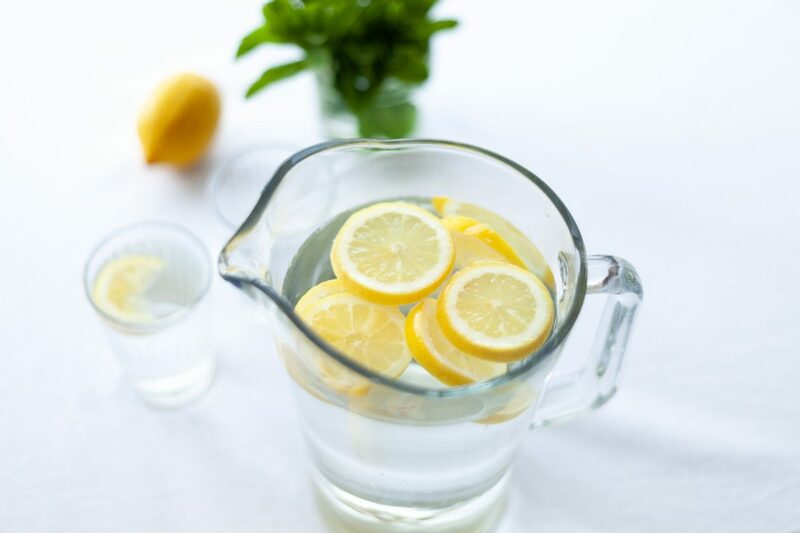 For more control over your flavors, you can also purchase plain sparkling water and mix in slices of lemon or lime. Most fruit juices contain added sugars, but even those that don’t can sometimes have more sugar than a can of soda. This is because fruit itself is high in sugar, and it takes several large pieces of fruit to make one small glass. While the sugar is natural, the juicing process removes the good-for-you fibers you’d get from eating the fruit in its original form. Instead of drinking orange juice, eat an orange and pair it with citrus-infused water. You can make this by adding slices of lemon, lime, orange, cucumber, and/or mint to a pitcher of water. If you want a stronger fruit flavor, juice half of your preferred citrus directly into the water. Your favorite bottled iced tea may be full of antioxidants, but don’t be surprised when you see a surplus of sugars in the ingredients list as well. Either opt for unsweetened teas or plan to make your own at home ahead of time. When you brew the tea yourself, you can control the amount of sugar added to the drink. A good rule of thumb is to add one teaspoon (or less!) of honey per cup of liquid, adjusting to your preference. Over time, you can add less and less and your taste buds will adjust. Colorful sports drinks may be full of electrolytes that refresh your body after a workout, but they’re also full of added sugars. Swap out the Gatorade or Powerade for natural coconut water, which some have called “Mother Nature’s sports drink” for how naturally hydrating and full of electrolytes and potassium it is. While it contains less sugar than sports beverages, it is not sugar free, so enjoy in moderation after exercise and not as a substitute for regular water. Yes, you can still have coffee on a healthy diet -- just think about what else is added to it. The sugar content of your daily Starbucks order can vary wildly, but the average flavored latte contains 35g of sugar. That's just five grams less than a can of soda! Black coffee, on the other hand, contains zero. If you aren’t one for a plain cup of joe, try a cafe classic like a caffè latte, which is just espresso and steamed milk--no added sugars. Try whole milk to start, since it can taste sweeter (and more luxurious!) than skim.